Teaching is my passion, and I enjoy teaching people how to play as much as I enjoy playing. 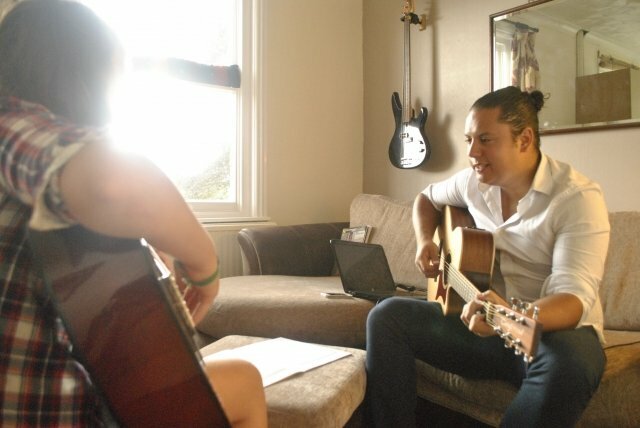 I have been offering guitar lessons in Chichester for a number of years now. I am registered with the RGT (registry of guitar tutors) and am happy to put students through their grades. I currently have 100% pass record and teach all the way up to grade 8. I teach a wide range of styles that include rock, blues, jazz, Latin, acoustic styles and much more. I teach a comprehensive understanding of theory and performance techniques as well as how to improvise and play in a band situation. I can also teach students how to compose music and write their own songs. Lessons are fun and relaxed, I am fully DBS checked and parents are welcome to sit in on lessons if they wish. I have been teaching for over 5 years full time privately. I also teach at Chichester college on their workshops and have taught on numerous workshops around West Sussex. My hours of one - one lesson experience has taught me that no two students are the same, however a lot of students do suffer from the same problems. One - one lessons with an experienced teacher can certainly help you overcome these issues and get you on the right track to playing much faster. I like to teach students to play by ear where they can. Aural perception (learning by ear) is over looked in todays world of Youtube and online content. Students find it so much easier after we have done a few simple exercises with the C major scale, and they really enjoy being able to play melodies they have worked out for themselves. Another approach is grades, a fun and structured way to get formal recognition of your skills. A also like to teach to the students strengths, so if you are into writing songs then I will teach you theory through composing. Everyone is different and I like to adapt to what works best for the student.